I try not to unduly influence the band with my mutinous DIY ways, but when it came to dropping big dollars on studio recording when we had never been through the process before I couldn’t keep my mouth shut. The result was last month’s drum engineering session in our dining room, which I spent a big chunk of yesterday mixing down. As opposed to a final mix of a song, these initial mixdowns are meant solely for the band to choose their favorite drum versions of each of the four songs we’re working on. That meant mixing the drum set faithfully to what we heard in the room, and then layering our obnoxiously loud click track and throwaway band performance in the midst of each take so we can tell if it was in-rhythm and up-to-speed. I also provided alternate mixes of each take as naked drums without the click and scratch so Zina could evaluate her performance. 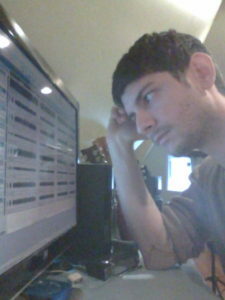 Self-portrait of me vs. the many takes of our first tune. Total number of mixdowns that required? Fifty six. Whenever it’s my job to capture art – whether that is in words, photos, videos, or recordings – I like to over capture. I never want to have missed a certain angle or the best song in a set. That’s why my solo recording rig involves not two but eight simultaneous tracks: I’m just covering all the angles. For drum engineering that meant a few things. One was the mic setup, which I covered in my prior post. Another was getting a ton of takes. I will not settle for the first take an artist feels okay with, because if we later locate one bobble on that we’re fucked (or I have to work a ton of splicing magic, which I am not above doing). I’m the same way with own recordings – even for 30 for 30 Project I always do an extra take after the one I’m happy with, and it’s usually the extra take I wind up using for the site. For Filmstar, that meant a few takes to get a song to the point we were confident about it, two takes we really liked, and then two or three more takes to make sure we had exhausted every possibility. That resulted in twelve takes on each of our two A-sides, plus five or more on two potential b-sides. A few of them could be tossed away, but that still left me with 28 takes of 8-tracks to wrangle, mixing down both with and without the click – 224 total individual tracks.